Fleas are insects, which are ubiquitous presently in the UK. It is predominantly the cat flea we find on our animals, and thus cats are far more likely to bring in fleas than the dog, although the cat flea also likes biting / feeding on dogs. They are not as likely to feed on people, that means you will rarely notice flea bites on yourself, and if you do, this is a sign of your environment being heavily infested with fleas. Being a parasite fleas are very interested in breeding / multiplying. They feed on / bite the animal within seconds of jumping on them and laying eggs within the next 24 hours. Those eggs will drop off the animal into the environment, i.e. blankets, dog bed, your bed, the carpet. They then roll deeper into fabric items to avoid the light. As a next step a larva will hatch from the egg after 1-10 days, eating the remainder of the egg, feeding on flea droppings / poo, and other organic matter. The larvae (there are 3 different larva stages) will – depending on room temperature and humidity – enter the pupa stage within 5-34 days, where they are cocooned like a butterfly and no chemical can touch them. The adult flea will hatch from the pupa stage within 5 – 140 days, again depending on temperature and humidity. Only the adult flea will jump on animals to feed / bite. Generally, flea population is seen as a pyramid (please see schematic on right), whereby the tiny tip is the number of adult fleas and all the remainder are the intermediate life stages, i.e. eggs, larvae, pupae in your environment. Thus, to control flea exposure effectively it is very important to not only treat your animals against the adult flea, but also to de-contaminate your house. Effective flea control will mean using a specific flea treatment (adulticide) every 4 weeks for at least the 3 months, ideally for your pet’s life. This recommendation is for most available spot-ons and tablets apart from the new product Bravecto, which is a tablet for dogs lasting for 3 months or Seresto collars for cats and dogs, which last up to 8 months. In addition, all other animals (mammals) in your household should also receive 4-weekly flea control, which ideally should be the same product used at the same time, although e.g. allergic animals may be prescribed a very particular product and other healthy animals may be able to receive a more mainstream product. As outlined above, it is not sufficient to control fleas by just treating the animals, your house as well as your car and other environments your pet stays regularly at (dog crèche, dog walker’s car, family members’ cars or houses) will have to be treated against fleas, too. In order to do so, areas of carpets, fabric couches and similar need to be hoovered thoroughly before a household anti-insecticide is applied (e.g. Indorex spray). Any blankets, beddings (also your own if your pet sleeps in your bed), cushion covers will need to be washed (ideally at 60 degree C), and once dried the spray needs to be applied. For the household treatment, it is very important to concentrate on areas where your pet usually roams / sleeps / plays. If there are rooms in your house your pet is never in, you do not need to hoover and spray those. The spray will kill adult fleas for 4 weeks, but have a residual activity on developing fleas (apart from the pupae stage) for a whole year. Please be very careful if you have fish or birds, as the spray is toxic to them. You should leave them in one room, which will not be sprayed, wait for 24 hours, then move the fish or birds (if possible), and spray that room they were on the following day. Please contact us with any specific questions with regards to fish or birds. 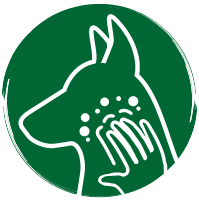 The flea treatment used on the pets will only kill fleas after they’ve bitten, thus flea hypersensitivity will still be triggered even when there is only the occasional flea visiting your pet. This is why it is so important to keep the flea exposure to your allergic pet as low as possible with above measures.